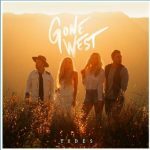 Colbie Caillat‘s no longer a solo artist: The “Bubbly” singer is now part of Gone West, a country quartet that includes her fiancé, Justin Young, her longtime collaborator, Jason Reeves, and his wife, Nellie Joy. Colbie admits she’s thrilled to ditch the solo life to be a member of a group. Gone West grew out of Colbie’s 2016 solo album, The Malibu Sessions. For that record, she, Justin, Jason and Nelly all lived together and wrote songs, and then went on tour together.